What Does Prehistoric Farming Say About Your Prefrontal Cortex? Understanding Mind From Matter: What Does Prehistoric Farming Say About Your Prefrontal Cortex? Coolidge, F. L., & Wynn, T. (2016). An introduction to cognitive archaeology. Current Directions in Psychological Science, 25, 386–392. When Howard Carter entered the tomb of the Egyptian pharaoh Tutankhamen, he knew he had struck gold. Years of missteps and boondoggles had put the revered archaeologist on the cusp of quitting, but Carter’s persistence paid off. Discovering King Tut’s treasure trove of intact artifacts led to a decade-long excavation that changed the face of modern archaeology. It opened a window into the culture and customs of ancient Egypt. According to Frederick L. Coolidge and Thomas Wynn (2016), however, archaeologists often ignore the cognitive processes required to construct ancient artifacts. Enter cognitive archaeology — what Coolidge and Wynn define as a new “approach to studying human cognitive evolution that applies theory and concepts developed in the cognitive sciences to archaeological remains of the prehistoric past” (p. 386). The value of King Tut’s sarcophagus may lie not only in its weight in gold, but also in understanding the complex cognitive processes humans would have needed in order to make it. Observe an artifact (or feature), such as an ancient tool or arrowhead. Reconstruct the techniques used to create the artifact. Master the methods that early humans used to create the artifacts. Infer what cognitive processes were available to our ancestors that enabled them to construct and use the artifacts. The second and third steps are tricky: Early humans had no libraries or social media, leaving modern scientists with little access to shared information about how to build the artifacts. Scientists often do the painstaking work of reverse-engineering ancient artifacts by experimenting with the procedures and knowledge that may have been available to our evolutionary ancestors (Stout, Schick, & Toth, 2009; Wadley, 2010). 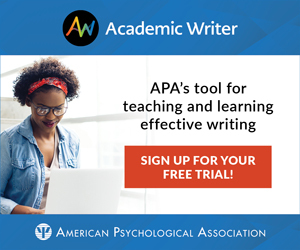 To take this cutting-edge science into the classroom, students can complete the following activity, which illustrates how physical artifacts can help psychologists understand the psychological processes needed to produce such artifacts. Time permitting, instructors can cover one or two artifacts. In these situations, I often divide the class into two large sections and assign one topic to each section. Begin by showing students Figure 1 from Coolidge and Wynn (2016; below). Walk students through each component of Coolidge and Wynn’s model. Next, have students form groups of three and encourage them to discuss a series of questions related to each of the following topics. To increase engagement, instructors may encourage students to use their smartphones and create a Twitter hashtag (#) that will help organize the class’s responses. You can use a large screen to display the Twitter feed. Ask the class to create the hashtag. Encourage them to use their creativity and humor. My students once created the hashtag #offdewall to curate their in-class Twitter responses. We had a good laugh. Topic 1: Why Don’t We Sleep in Trees? Observe. Homo erectus, our bipedal ancestors, left artifacts that suggest they slept on the ground — what archaeologists call terrestrial sleep — rather than in the trees. This was a major breakthrough because it enabled early humans to experience more quality sleep and REM sleep (Samson & Nunn, 2015). Reconstruct. What sorts of technical systems would have been in place to enable our early ancestors to build sleeping structures on the ground rather than in the trees? Master the method. What sorts of procedures would early humans have used to construct ground sleeping structures? What knowledge would they have needed to ensure that they would sleep safely? Infer. How might artifacts related to terrestrial sleep offer clues regarding the minds of early humans? For example, sleep quality predicts better physical health, mental health, memory, and concentration (Baglioni et al., 2016; Dement, 2000; Pace-Schott, Germain, & Milad, 2015; Prather, Janicki-Deverts, Hall, & Cohen, 2015). Because terrestrial sleep enhances sleep quality, how might that help us understand differences in the psychology of early humans who did versus did not make the transition to terrestrial sleeping? Topic 2: What Does Prehistoric Farming Say About Your Prefrontal Cortex? Observe. Nearly 12,000 years ago, humans started farming. Archaeologists have observed several artifacts that confirm this transition from hunting and gathering to farming. Reconstruct. What sorts of technical systems would have been in place to enable our early ancestors to plant, cultivate, harvest, and store crops? Master the method. What sorts of procedures would early farmers have used? What knowledge would they have needed in order to ensure that they would farm enough to feed themselves, their families, and potentially larger communities? Infer. How might artifacts related to the advent of farming help us understand the psychology of early humans? For example, early farmers needed a sophisticated understanding of time, such as when to plant, how long certain crops would need to grow, and how different crops need different amounts of time to harvest. Coolidge and Wynn argue that early farmers also would have needed a powerful prefrontal cortex to help them to delay “the immediate gratification of eating seeds to planting them and harvesting them over varying lengths of time” (p. 389). spear-makers. By understanding the cognitive processes necessary to make certain artifacts, cognitive archaeologists can better grasp how our evolutionary ancestors thought, felt, and acted. Kortum, P., & Byrne, M. (2016). The importance of psychological science in a voter’s ability to cast a vote. Current Directions in Psychological Science, 25, 467–473. Having explained that negative reinforcement ≠ punishment, we teachers are astonished when students misremember what we think we have so clearly taught. Imagine rapping your knuckles on a table to convey a familiar tune, such as “Mary Had a Little Lamb” or “Happy Birthday,” to a friend. Thanks to the curse of knowledge, the tune seems obvious to us. But our seemingly dim-witted friend finds it incomprehensible (Newton, 1990). E-mail senders often are surprised when their readers don’t discern their “just kidding” teasing and take offense (Epley, Keysar, Van Boven, & Gilovich, 2004; Kruger, Epley, Parker, & Ng, 2005). Such “human perceptual and cognitive limitations also pose a serious and immediate threat” to democracy’s voting systems, note Philip Kortum and Michael Byrne (2016). In case after case, the people who design and word ballots assume that what’s clear to them will be similarly clear to all voters. Thus, when the Palm Beach County elections supervisor designed the infamous “butterfly ballot” for the 2000 election, it was perfectly clear to her that those favoring the second set of candidates should punch the third hole from the top. Alas, voter confusion caused enough Gore voters to punch Buchanan to flip the state outcome — and the presidency — from Gore to Bush … thus altering the course of history (Fig. 1). In addition to such perceptual fiascoes, Kortum and Byrne also note that voting procedures can yield ambiguously marked ballots. After 2.8 million Minnesotans chose between US Senate candidates Al Franken and Norm Coleman, fewer than 300 votes separated the candidates. The recount of several thousand ballots, such as the one shown in Figure 2, swung the vote to Franken. To illustrate the perceptual psychology of voting, instructors may wish to visit tinyurl.com/ballotpsychology, where they will find sample ballots created by Kortum and his colleagues and a scale for assessing their usability. Responding to several of the layouts will illustrate both clear and unclear alternative designs (civicdesign.org/fieldguides offers guidelines for clear ballots). 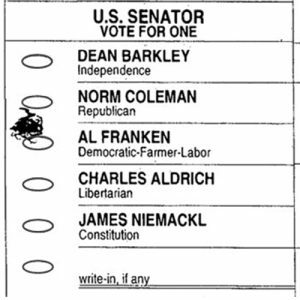 For a second activity, tinyurl.com/ballotpsychology2 will take students to a Minnesota Public Radio website that invites students to judge Franken versus Coleman voter intentions, and then to compare their judgments with those of more than 100,000 other respondents. Auditory processing. Hearing, like vision, occurs top-down as well as bottom-up. Therefore, misperceptions can color hearing, leading listeners to mishear what speakers perceive themselves as having plainly said. It’s a phenomenon that, as a person with hearing loss, I frequently experience. At a recent advisory council meeting of the National Institutes of Health’s National Institute on Deafness and Other Communication Disorders, I was surprised to hear one of its executives repeatedly mention the Institute’s “missionaries.” Who are these people, I wondered — evangelists for hearing health? On about the fifth utterance, I recomputed: mission areas. But it’s not just people with hearing loss. Depending on the context (such as happy or sad music playing), our meaning-making brains may mishear “morning” as “mourning,” “dye” as “die,” or “pane” as “pain” (Halberstadt, Niedenthal, & Kushner, 1995). The power of framing. More than many people suppose, the mere wording of a proposition can shift people’s expressed views. Voters have been more supportive of “assistance to the poor” than “welfare” (Time, 1994). They have favored cutting “foreign aid” but increasing spending “to help hungry people in other nations” (Simon, 1996). “Gun safety” initiatives, such as requiring background checks, elicit more public support than “gun control” (Steinhauer, 2015). The list of ways in which humans perceive or believe incorrectly goes on. Our thinking, while often accurate and generally adaptive, is vulnerable to perceptual set, selective inattention, change blindness, stereotyping, confirmation bias, belief perseverance, overconfidence, self-serving bias, overreliance on heuristics, false consensus, illusory correlations, priming effects, and much more. And that is why Kortum and Byrne are surely right to remind us that “human perceptual and cognitive limitations” can distort voting and to recommend universal ballot design principles that accommodate the human factor. Baglioni, C., Nanovska, S., Regen, W., Spiegelhalder, K., Feige, B., Nissen, C., … Riemann, D. (2016). Sleep and mental disorders: A meta-analysis of polysomnographic research. Psychological Bulletin, 142, 969–990. Dement, W. C. (2000). The promise of sleep: A pioneer in sleep medicine explores the vital connection between health, happiness, and a good night’s sleep. New York, NY: Dell. Halberstadt, J. B., Niedenthal, P. M., & Kushner, J. (1995). Resolution of lexical ambiguity by emotional state. Psychological Science, 6, 278–282. Kruger, J., Epley, N., Parker, J., & Ng, Z.-W. (2005). Egocentrism over e-mail: Can we communicate as well as we think? Journal of Personality and Social Psychology, 89, 925–936. Newton, E. L. (1990). The rocky road from actions to intentions. Dissertation Abstracts International, 51, 4105. Pace-Schott, E. F., Germain, A., & Milad, M. R. (2015). Effects of sleep on memory for conditioned fear and fear extinction. Psychological Bulletin, 141, 835–857. Prather, A. A., Janicki-Deverts, D., Hall, M. H., & Cohen, S. (2015). Behaviorally assessed sleep and susceptibility to the common cold. Sleep, 38, 1353–1359. Samson, D. R., & Nunn, C. L. (2015). Sleep intensity and the evolution of human cognition. Evolutionary Anthropology: Issues, News, and Reviews, 24, 225–237. Simon, P. (1996, April 17). American provincials. Christian Century, pp. 421–422. Stout, D., Schick, K., & Toth, N. (2009). Understanding Oldowan knapping skill: Anexperimental study of skill acquisition in modern humans. In K. Schick & N. Toth (Eds. ), The cutting edge: New approaches to the archaeology of human origins (pp. 247–266). Gosport, IN: Stone Age Institute Press. Wadley, L. (2010). Compound‐adhesive manufacture as a behavioral proxy for complex cognition in the Middle Stone Age. Current Anthropology, 51, S111–S119.